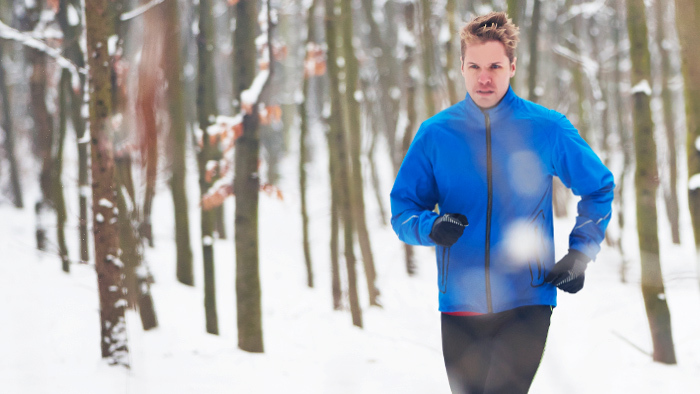 Exercising when it’s cold outside is a great way to fight the winter blues, which is common for many endurance athletes who live in cold weather climate areas. Some of my favorite runs happen when it’s below freezing, I love the sense of calm and peace in the air. While this can be great mentally, it’s important to stay well hydrated to ensure you are getting the benefits physically as well. The thought of drinking something cold when it’s cold outside may be make you cringe, but science tells us that hydration during cold weather is critical. Make sure you properly hydrate before your run. A general recommendation from the American College of Sports Medicine Position Stand is to drink five to seven milliliters of water or sports drink per kilogram body weight (about one ounce per every 10 pounds of body weight) about four hours before exercise begins. The best rule of thumb is to let physiologic symptoms of thirst (dry mouth, craving water) or overdrinking (nausea, sloshing) and evaluating color of urine (it should be light yellow or clear) guide hydration prior to your run. While physiologic symptoms are best to guide hydration prior to your run, research shows that it is often not the best indicator during a run. It is recommended to perform a sweat test often and ensure you are replacing the correct amount of fluids lost during your activity. You can perform a sweat test by weighing yourself before and after exercising for one hour. Keep track of your intake during the activity (one medium gulp is roughly equivalent to one ounce). Also, keep track of any fluid losses other than through sweat (hopefully you don’t have to use the restroom during that one-hour test). Multiply the pounds lost by 16 to convert to total ounces lost. That is how many ounces that should be replaced each hour during your cold weather activity. I usually recommend dividing that number by four and aim to take in water every 15 minutes. The number will vary depending on many conditions so it is recommended to perform a sweat test often. After exercise, it is important to replace fluids and electrolyte deficits. The recommendation from the American College of Sports Medicine Position Stand is to replace 1.5 liters of fluid per kilogram weight lost. Electrolytes can be replaced by consuming snacks and beverages with sodium. Watch for symptoms of dehydration: thirst, unusual fatigue, lightheadedness, headache, dark urine, dry mouth, infrequent urination or an unusually rapid heartbeat. Overdrinking can be an issue as well causing a dangerous condition called hyponatremia. Symptoms of overdrinking include sloshing, nausea and dizziness. To dial in your hydration plan, consult a registered dietitian. They will not only help you figure out what to drink during training and on race day, but can assist with proper fueling as well. Caryn Kusleika is a Registered Dietitian Nutritionist and USAT Level One Coach and is excited to prepare athletes by helping them set goals so they can have great energy throughout training and on race day to perform at their best. She provides nutrition information and coaching to endurance athletes though her business, High Octane Wellness. She knows first-hand the results that great nutrition and coaching can provide because she has competed in various endurance events across the Midwest.